Anyone with thick hair, a beard, or even a pet understands the importance of brushing and combing out large clumps and knots. By leaving them in place, you’re choking out the healthy parts of your hair, and it remains looking like a real mess. Similarly, your yard needs the same sort of combing method to continue growing its best. Through yard dethatching, your grass will appear like it just came home from the barber! Unfortunately, most people don’t take the time to dethatch their yard. Most tools and equipment created for home lawn dethatching just aren’t that efficient. A thatching rake, for example, is efficient at what it does. But it also takes forever, and it can leave your hands and back stiff and sore. Instead, it’s recommended to call the local landscaping professionals at Lawn Works. Our team has the industrial yard dethatching machine that makes short work of even the thickest grass. If you’ve ever wondered how golf courses, sporting arenas, and shopping plazas achieve their checkboard-style grass cutting pattern, chances are it’s from a dethatcher. By cutting grass short first and making two passes with the machine, it creates a crisp design in the yard that promotes better growth. The grassy areas appear professionally manicured, and they receive better access to water, oxygen, and other natural nutrients. Your yard will look, feel, and grow better than ever before! Best of all, our professional dethatching machine is the faster alternative to hand-powered tools. It won't be long and your yard is professionally dethatched and ready for increased plant growth. Many homeowners become dismayed at the yard’s initial appearance. It’s a natural reaction, considering that the yard more or less became tossed up by the machine. However, this is a natural part of the process, and before too long your grass will grow back in. The grass is a much hardier plant than we often give it credit for, and despite the stress, it undergoes in dethatching, it usually recovers entirely in just a couple of days. If your yard looks a bit scarce after the process, the good news is that following dethatching is the prime opportunity to plant new grass seed. If you have been considering planting new seeds or plants, dethatching may be the best way to start your new lawn. Not only is the tilled soil ideal for new seeds to germinate, but the soil has become enriched with fresh oxygen. You’ll be amazed at how suddenly your new seeds and grass growth sets in! 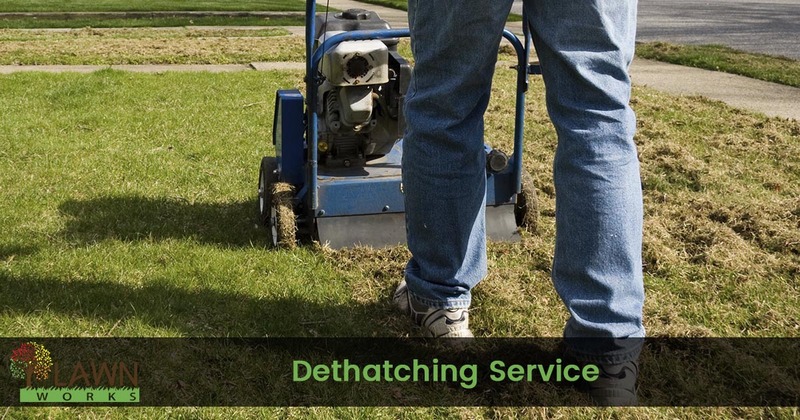 If it seems as if you’ve tried everything to get your yard to grow better and nothing is achieving results, then it’s time to call the professional choice in yard dethatching. Our team will soon have your yard growing its best with a simple application. Call today for your yard’s best treatment and have your lawn ready for the spring. You’ll be glad you called the company with the right tools for the job!